I understand now I should not have deleted that line, but the funny thing is: it runs even without it. I'm totally agree with you about single line, I also like better that way. I'll start using it since now. I'll run some test on several diferent machines I have at home and let you know, just to discart some potential troubles caused by any stupid Bios. Well, Wonko is right by definition. and we are back to square #1, after all these posts I cannot make head or tail of the reports both alacran and wimb made. There is internal variable @root, so you can remove this line and use @root instead of myroot. This can handle the cases where hd number is 1 digits. It will override one of (hd2)..(hd10) but it should be OK because mydisk will not be equal to root hd number. If you really want to calculate mydisk = root_hd_number+1, this handle the case where root hd number is 1 to 3 digit. hd number overflows at 128. This will not be used but since I have already think about it, I write it here as an example. You don't have to use set, variable, string manipulation, calculation. It looks simple. I already know since long time ago this is your prefered way to work. I can't talk for wimb, but in my case using an Spanish keyboard is a nightmare try to type something on grub4dos command line, even if it takes more time and more reboots it is easier for me to make changes to a menu.lst title on running OS, or WinPE. Thanks for interesting solution using mapping as (hd), which is working here ok. I have tested on one (not my own) computer, but next week I will be able to test on my own computer. As expected at the time, after the initial interest, the whole thing "faded away" into oblivion, maybe this is the occasion to re-vamp the spreadsheet I made. Anyway, one could well use a "high" (and "fixed") disk number - say - (hd27) or (hd31) and be done with it? Unless I am mistaken, (hd31) should be the last "hard disk" mappable, (hd32) is a CD-like device. 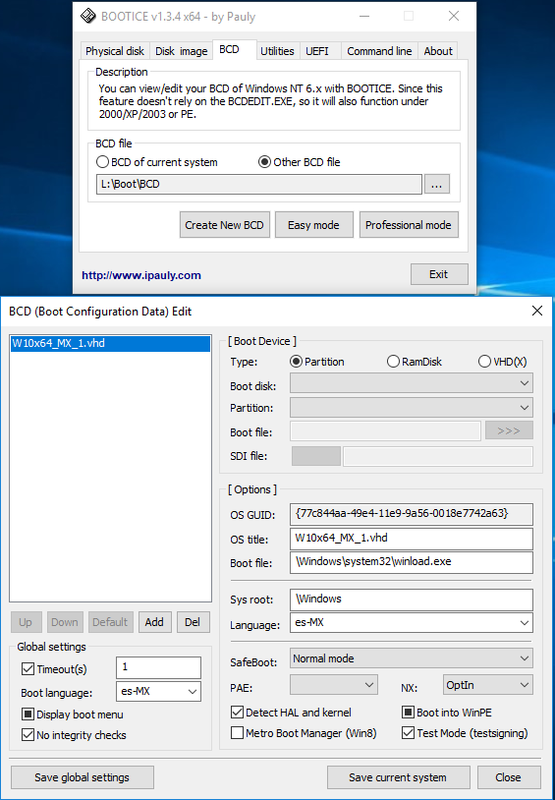 Easy2Boot contains a number of keyboard scan code translation files for different languages, including Spanish, in the \_ISO\e2b\grub folder. 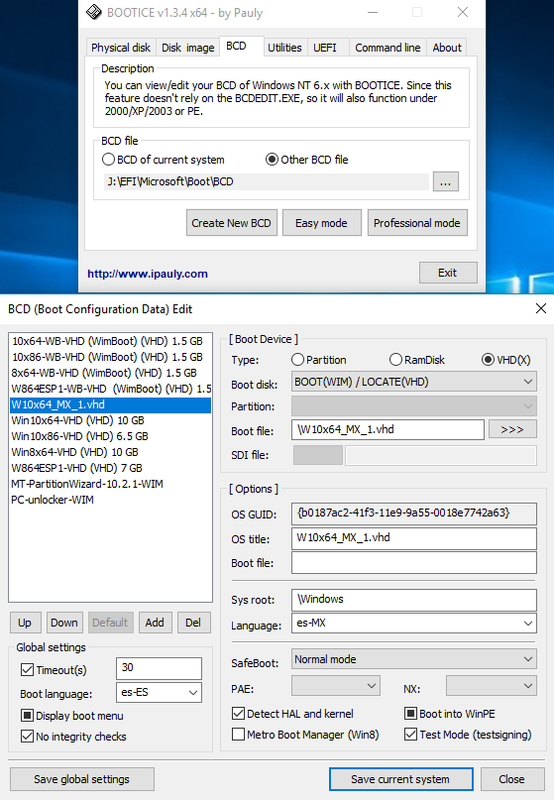 Yes it is required, WinSetup itself creates an internal BCD that we latter will use when Rambooting. Wimb program only thing does to it is made some changes (all this can be seen/done on BootIce BCD tab easy mode) to adaptate it as: select Test Mode (testsingning), detect Hal and Kernell, select Optim, select No integrity Checks (not mandatory, it is mandatory for WinPE boot wims) and Unselecting Metro Boot Manager, some changes are required to let us install and boot using the unsingned SVBus driver, and also on BootIce BCD tab professional mode it verifies/changes BootMenuPolicy to legacy if required. On 10 VHD on internal HD.png (VHD located on internal hd1), when VHD is loaded on Ram during Ramboot it becomes virtual hd2. On 10 VHD on external HD.png (VHD located now on external USB disk hd2) the external USB disk adds another device before yet Rambooting so now VHD is located on hd2, then when Rambooting and VHD is loaded on Ram it becomes virtual hd3. Then if the 10 VHD is not loaded on Ram on the right hd it can't find this path: \Windows\system32\winload.exe to boot. I perfectly understand you are right reading and interpreting the instructions but the fact is the 10 VHD had to be loaded in Ram on the right hd since if not it can't boot. You may try to load it directly to the hd0 and it won't work, wimb have tested this since the first time as this was the clasical/obvious option to start with. I have found on grub4dos, because on my frecuent misstyping of commands several cases where the program should not do something because latter i found it has a wrong syntax, but it does do the action fine, don't ask me why, it is obviously caused because the program itself allows it, this is not the place to talk about all this cases, but maybe I start a diferent thread about this latter. Right now the important subject is the right/proper command to use. And I can say karyonix command is very clear and easy to remember and it works fantastic on my tests on 10 VHDs. Now, please tell me how I select on grub4dos to use the spanish keyboard (command to run this file). re. 10 VHD on external USB - so if you try using that grub4dos menu on a different system with a different number of hard disks - does it boot? Yes, I have tested it on PCs with 1 and 2 internal HDs and wimb on his PC with 3 internal HDs. The question was - if you use exactly the same grub4dos menu and exactly the same VHD, can you boot it on many different systems which have a different number of internal hard disks? NO, the VHD needs to load drivers and it fails (if VHD is too small), you can use same wimboot source, but VHD needs to be rebuild if hardware is diferent. The menu works on diferent number of internal drives. 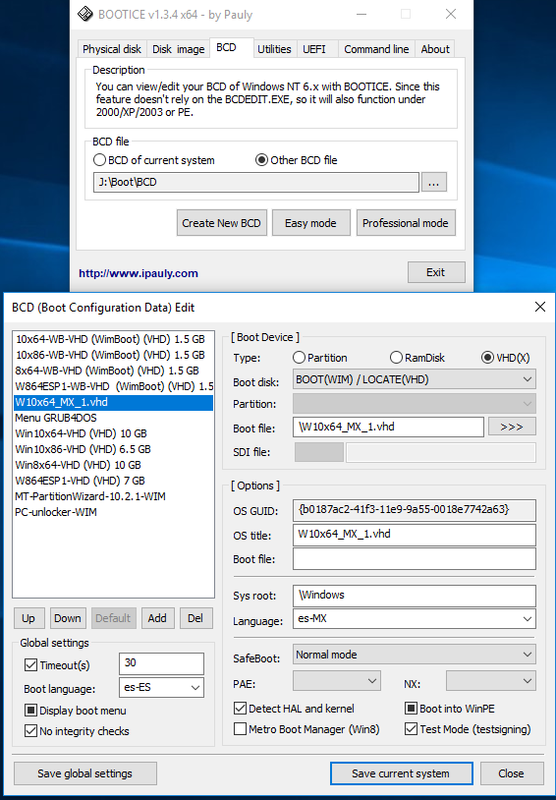 OK - in post #183, you are setting the BCD in BootIce to boot from a disk, not from RAM or VHD. Have you tried changing it to RAM or VHD? 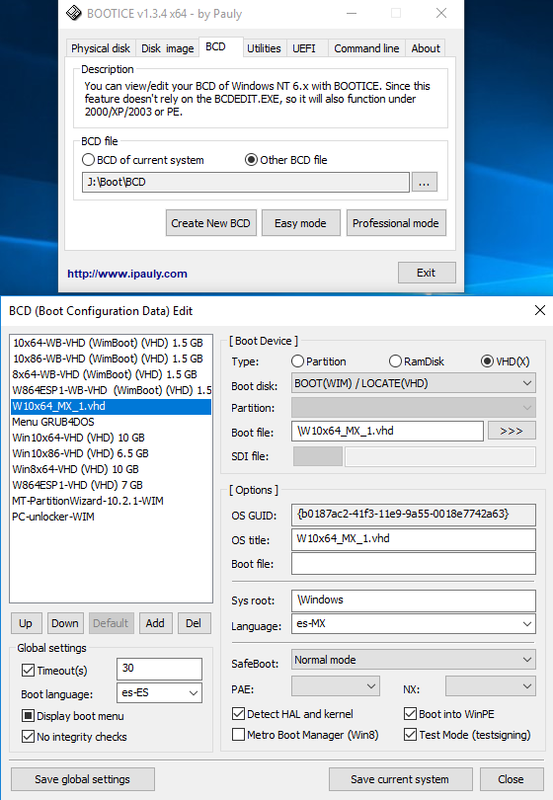 In post 183 all talk is about Ramboot and the 2 pictures are of the BCDs located into the OS contained into the VHD, those BCDs are called by bootmanager to boot the VHD that is allready loaded on Ram. Please read it again carefully. chainloader /bootmgr >>>>> This is the bootmanager allready loaded on Ram. 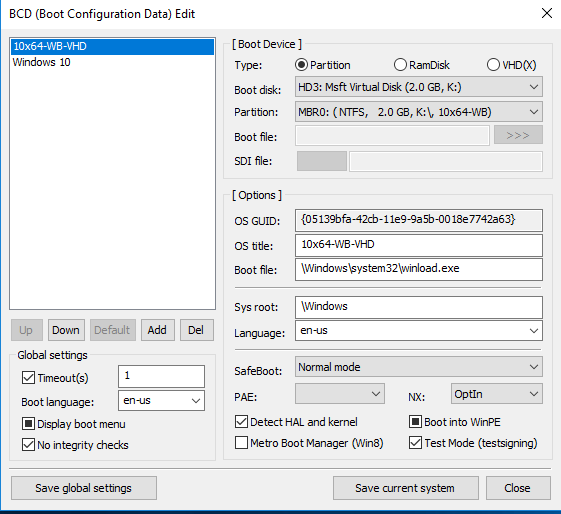 The answer is YES, but you need sufficient FREE space inside the VHD for drivers to be loaded for the new hardware, but the grub4dos menu works on systems with variable configuration. you can re-gain FREE space by doing CAPTURE - Format - APPLY sequence on the VHD. 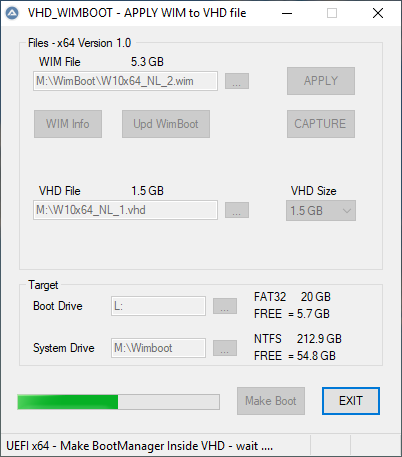 The WIM file then contains all driver files instead of the VHD and you are able also to install that improved Vwim file on small 2 GB VHD. 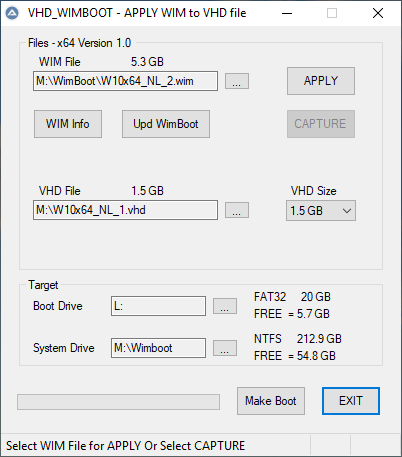 WIMBOOT Capture of Full Win10x64 and Applied on VHD, occupies in VHD only 200 MB at rest, but on booting about 600 MB. 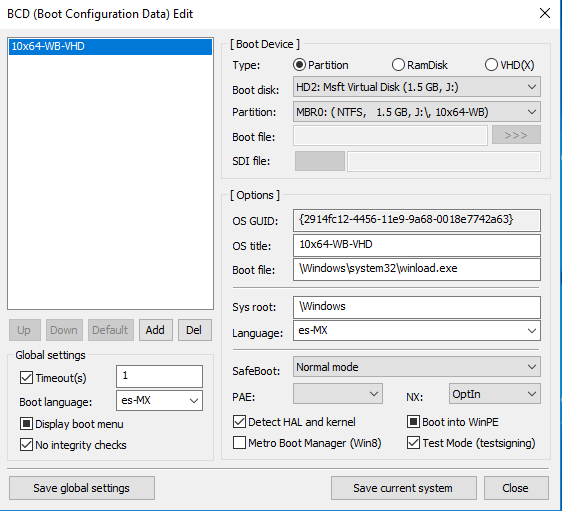 For booting from RAMDISK then a small 2 GB VHD is desired, which has limited space to install new drivers on unknown hardware. Just to let you know here all is working fine now, still trying on some other PCs, if I find any trouble I'll let you know ASAP. Portability seems to be feasible without the learning process, of course we need more test on more PCs to confirm this in a total way. I used to test my 10x64-WB-LZX.wim (2.92 GB LZX compressed), VHD build was made on USB SSD drive using Win7 (just to test) without any issue. My friend, I'm sorry to tell you all BCD(s) are wrong, no Ramboot, no bootmanager boot. But I thing it will be easy for you to fix this. But after fixing the BCDs my W10x64_MX_1.vhd Rambooted very fine. Well, after the report, let me tell you to make this tool was a very good idea, all is done with one single tool (fool prof). It was also a good idea to find the OS lang and apply it to VHD name and BCDs. I noticed VHD_WIMBOOT\makebt\WimBootCompress.ini, I assume it is not hard coded into your program, and there is only a call to it, because sometime we may need to edit it, is that right? Attached BCDs pictures, the first tree are as per the program is making them now, the second tree are the corrected BCDs. I need to test in Win 7 OS, which might be the cause of the problem. Can you test in Windows 10 x64 OS and using XPRESS 4K ? That is what I used. There are some strange things like Boot into WinPE, which setting is not done by my program. 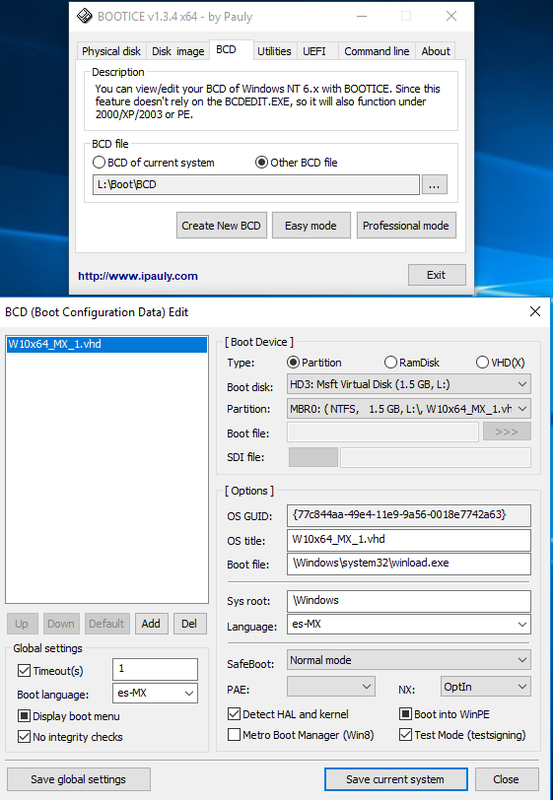 Also the Internal BCD is certainly wrong as made in your case and working fine in my case when using Win10 x64 OS. The WimBootCompress.ini file can be modified and is not hardcoded in the program, but the filename is hardcoded. The LZX Compression can be added as option. GZ Compression has as disadvantage that you can only boot from RAMDISK. That seems for me a matter of personal preference. I like to have files that boot as FILEDISK and as RAMDISK. Booting from RAMDISK is already very fast for the 1.5 GB, so the GZ Compression does not seem such an advantage. On external legacy BCD (on Fat 32 drive): Wrong boot file, wrong OS name and wrong language. On external EFI BCD (on Fat 32 drive): Same as previous. On internal legacy BCD (on VHD drive): Wrong OS name and wrong language. Also on menu.lst wrong VHD name. But anyway without fixing anything I decided to Ramboot the VHD and it booted very fine, also confirmed this way it is in fact 8.1x64, without any dubt.